We've already seen buildings fall and the English language get its throat slit open in an alleyway next to said building, which means now's the perfect time to look away and turn our attention toward everyone's favorite thing: weapon attachments. DICE dedicated a rather lengthy blog post to describing how we'll be mixing and matching our tools of destruction in the shiny new Battlefield . While DICE didn't specifically say how many guns and accessories there'd be in Battlefield 4, it calculated the total number of combinations surpassed 240,000. The post mentions some stuff you'd expect from a sequel to the Battlefield franchise—more weapon attachments, and more slots on your gun to snap on said attachments. Thankfully, the post had more to say than just that. There are a decent number of features revealed in the blog post, but being able to zero in your scope was the one that caught my eye. Battlefield follows the laws of gravity, meaning you have to calculate bullet drop while lining your sights on a target. And, for those who prefer to stay a mile or so away from the front lines, there's a new 40x scope for you to gaze at your enemies with—right before violently exposing their cranial cavity. 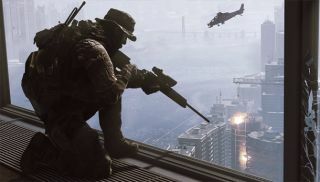 Battlefield 4's also introducing “battle pickups,” which is just a fancy phrase for weapons you pick up on the battlefield that aren't necessarily part of your class. Anyone familiar with shooters (which, I'll just assume you are) should also be familiar with the concept. The blog post uses a sniper rifle lying up near a radar dish, which is perfect for picking off enemy stragglers. Battlefield's maps are massive enough that I don't expect to see piles of dead bodies around weapon spawns like you'd normally see in something like Halo. At least, I assume that's the case.